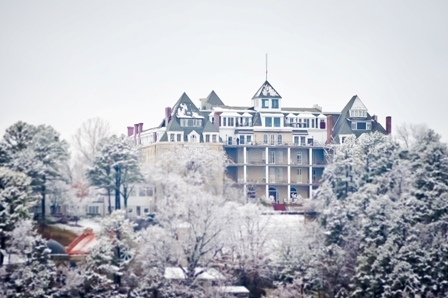 The 1886 Crescent Hotel, well known today as being a mountaintop spa resort in the Arkansas Ozarks, was once used as a Cancer Curing Hospital which was under the control of the hospital’s owner, charlatan Norman Baker from Muscatine, Iowa. 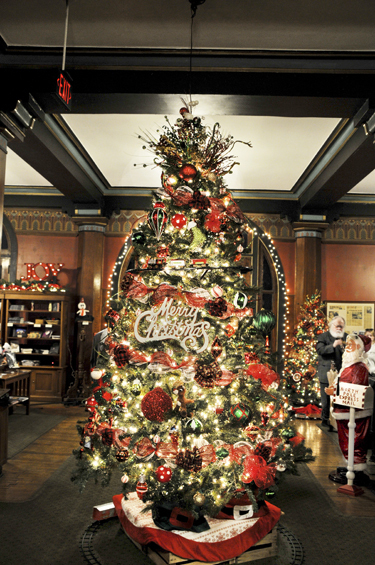 Baker operated his Eureka Springs’ facility from 1937 until December 1940. Many of his “medical methods” were revealed in his brochure which was mailed out to thousands across the country boasting his miraculous cure. Copies of that mailer are now in the hotel archives. 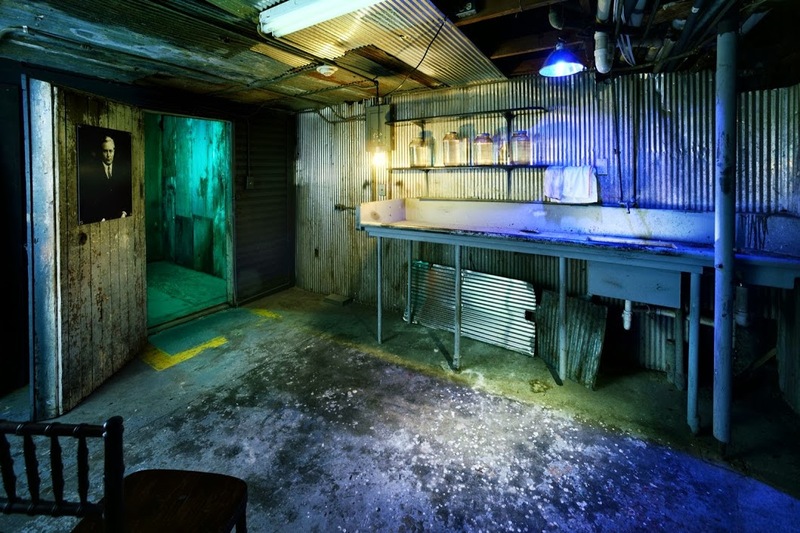 However, other more hard artifacts left behind are in the part of the hotel’s basement called “the morgue” where patrons can see Baker’s autopsy table and the walk-in cooler where he kept body parts and cadavers. 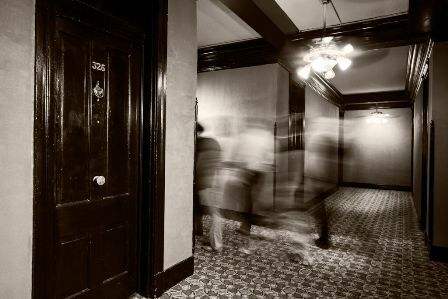 Legend says that when new hotel owners, several owners removed from Baker’s days, purchased the hotel in the 1960s, numerous bottles of medical specimens and “cures”, were found in the morgue area. That legend goes on to say that these ‘60s owners, “got rid of” all of those bottles, etc. that Baker left behind upon his arrest in December 1939. No one ever quite knew as to where exactly those bottles had been “dumped”. Flash ahead to February 5, 2019 when the hotel’s on-site landscape artist, Susan Benson, was instructed to expand a lower parking area near the northeast corner of the hotel’s 15 acres. It was on that Tuesday morning at about 11:30 when a discovery was made. There, uncovered by the first scrape of the backhoe, were, what looked like, medical style bottles. Benson immediately reached out to hotel’s manager of ghost tours, Keith Scales, that these bottles had been found. Scales compared those few bottles so excavated with those displayed in a Baker promotional poster and they matched up perfectly. Realizing this could be an important find, Benson and Scales contacted the hotel general manager, Jack Moyer. Moyer went to the site to investigate and agreed that these bottles could represent a very important find for the hotel and the history of its time as a cancer hospital. 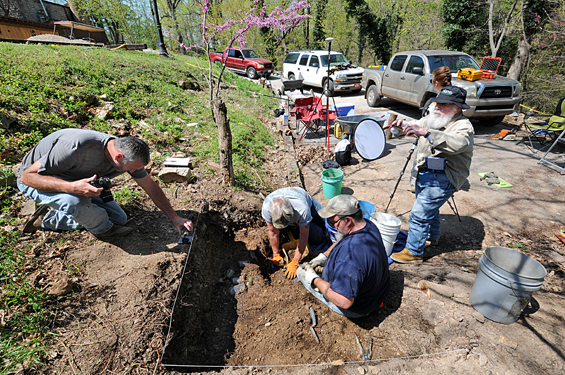 The site was secured and the University of Arkansas at Fayetteville’s Archeological Survey Team was called. These archeologists suggested a list of critical steps of protocol before they could become involved in an archeological dig. Those steps included calling local police who in turn were asked to inform the state crime lab and then contacting a HAZMAT team to come and investigate in order to give the “all clear,” allowing the safe extraction and handling of those historic medical bottles. Over the next few days the site was swarming with officials doing their investigation. Upon artifact authenticity and safety confirmed, the Arkansas Archeological Survey Team (AAST) was so informed of those clearances and an initial visit to the site was made. 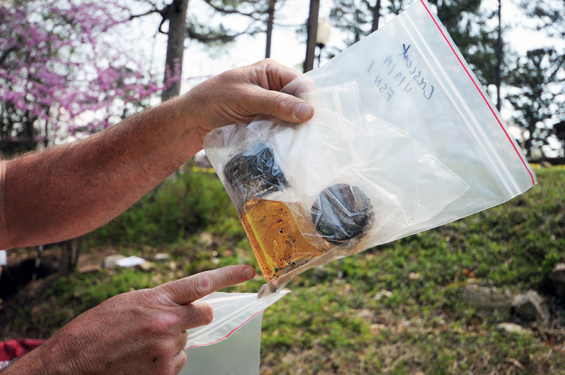 A plan for a formal archeological dig was then formulated and AAST arrived on the hotel property on April 9, 2019 to begin their investigation, extraction and examination of items so buried. Read more on the 400 glass bottles that have been unearthed in the backyard of the Crescent Hotel. Enjoy a Grand Easter Brunch served in the Crystal Ballroom with all the traditional fixings. 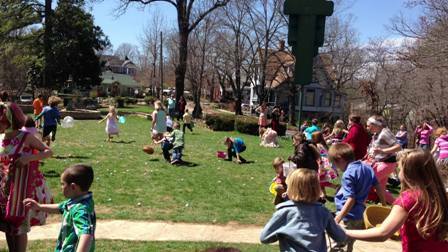 Egg Hunt begins at 1pm in the Fountain Garden for kids 5 and under. 1:15pm for kids 6+. > Wine Tastings in the Crystal Dining Room & Craft Beer Tastings in the SkyBar… adults only. 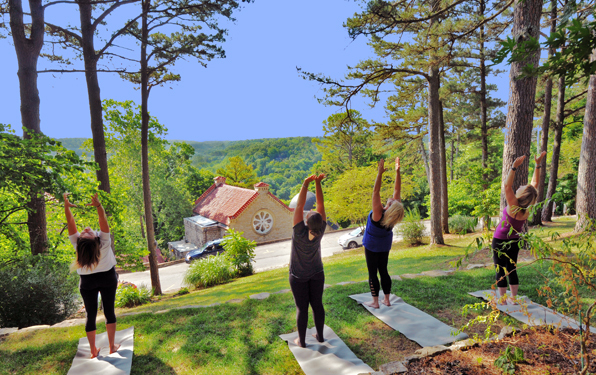 > Plus such “ya gotta do ‘em” activities as New Moon & You, Morning Stretch, Campfire Fun (s’mores included), Fitness Walk, Crescent Art Tour, Sunrise Stretch, History Tour, Gentle Yoga Flow, “Not Really A Door” Performance, Scenic Power Walk, High Times in the SkyBar, and more! And if that’s not enough to keep you entertained and busy, the Crescent’s shuttle van will take you downtown to discover Eureka Springs’ Downtown Shopping & Entertainment District. 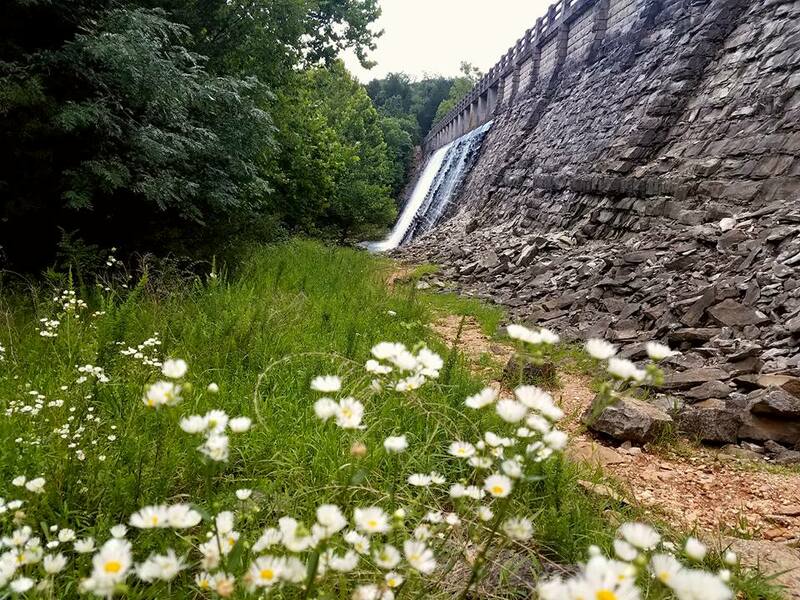 Also, super family attractions in Greater Eureka Springs can be found at EurekaSpringsOnline.com/spring-break-2019/. 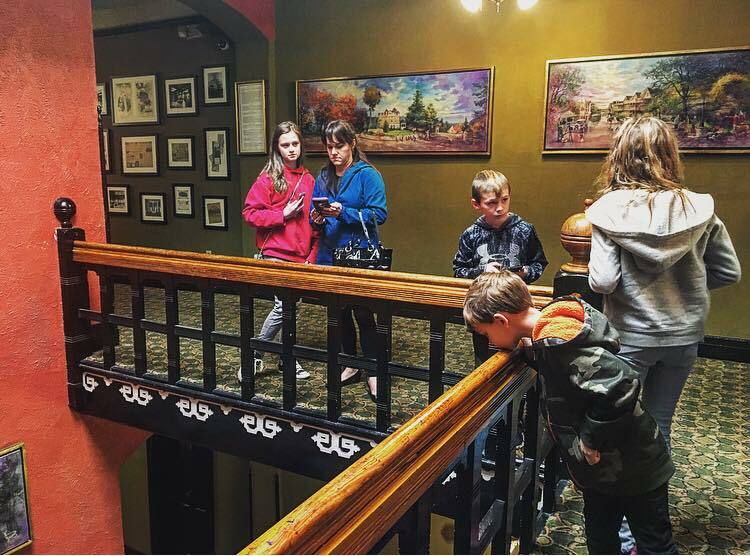 Now you can see why the only thing Spring Breakers at the historic 1886 Crescent Hotel & Spa ask for are a few more days to experience even more family fun and activities. So make your reservations today; rooms are filling up fast. Don’t Miss 2 Parades/ 3 Balls and Loads of Fun! 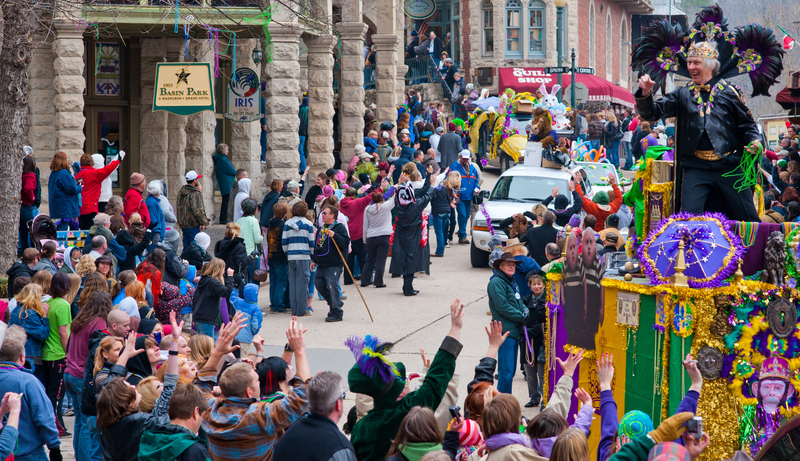 Eureka Springs Mardi Festival kicks off February 21st – March 5th with 2 full weekends of festivities. February 23rd check out the Mardi Gras Night Parade followed by the Black Light Ball at Chelsea’s. Tickets $35-this will sell out! 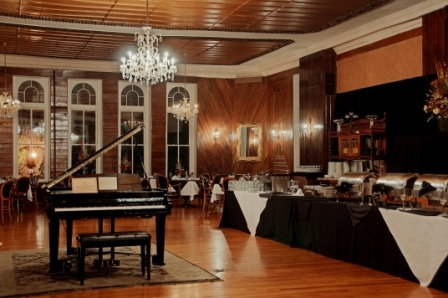 March 3rd end the weekend with a Jazz Brunch at the Crescent Hotel. 11AM-2PM. $29.95 per person. Enjoy fine dining at the Jazz Champagne Brunch in the Crystal Dining Room at the world famous Crescent Hotel. Feast on food, fun, music, and join in on the 2nd line dance. Call for reservations: 877-342-9766. *Regular menu service will also be offered this evening. The 1886 Crescent Hotel & Spa is all about tradition. 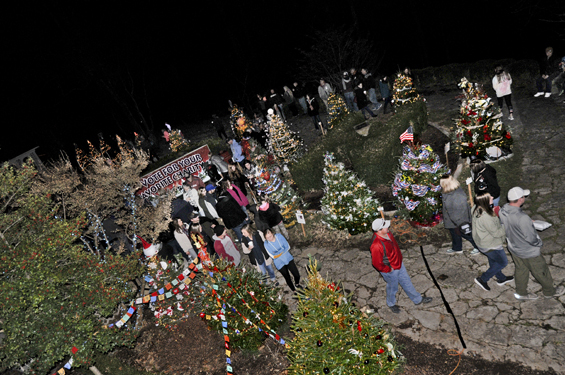 One tradition that started in 2008 as part of the 7th Annual Christmas At The Crescent Celebration was the “growing” of the “Christmas Forest”, an effort to raise money for local and area charities. 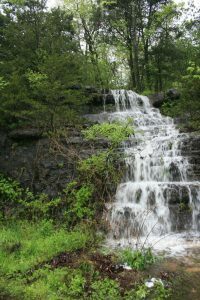 In the past 10 years this forest has now harvested nearly $50,000 in local area charitable contributions. “The concept is quite simple,” Moyer explained. 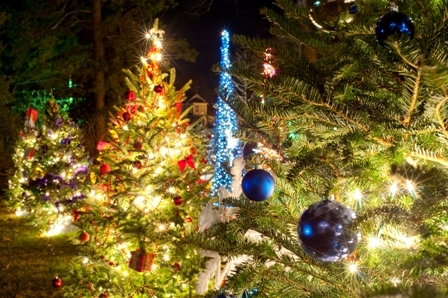 “On or about Thanksgiving each year, we purchase, plus have donated, around 30 or more real evergreen trees. The hotel places them on our property adorning each with lights. Charities then come in, usually represented in part by one or more of our employees, and decorate their tree as festively as possible. And what an amazing job they do each year. The trees are absolutely gorgeous. Those charities that took top honors this year are Imagination Library in first place with $3,830 in votes, OARS (Ozark AIDS Resources & Services) in second place with $2,344, and Project Self Esteem in third place with $1,022. The Lifetime Memories Ice Rink will be closing for the season on Sunday, 2/17. Don’t miss this last week of skating! Skating Rink is $5 to skate with rentals. Friday, 2/8 – Friday Night Fun! 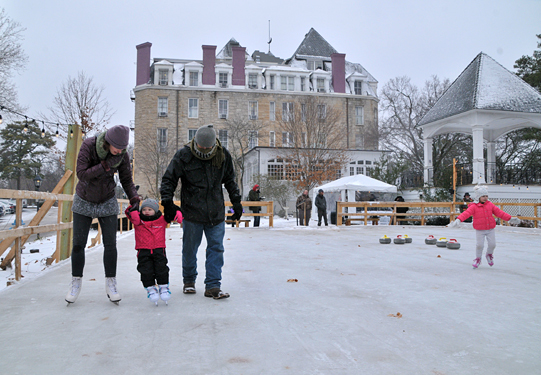 Enjoy Curling on Ice at 4PM followed by Skating, Hatchet Throwing, snacks & beverages plus warm up by the firepit from 5PM-7PM. Friday, 2/15 – Friday Night Fun! 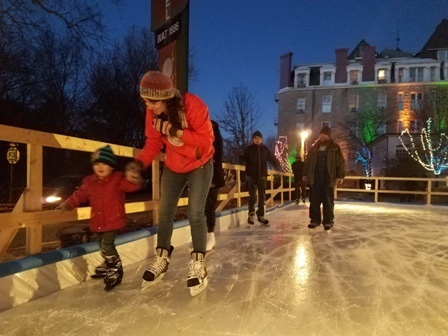 Enjoy Curling on Ice at 4PM followed by Skating, Hatchet Throwing, snacks & beverages plus warm up by the firepit from 5PM-7PM. 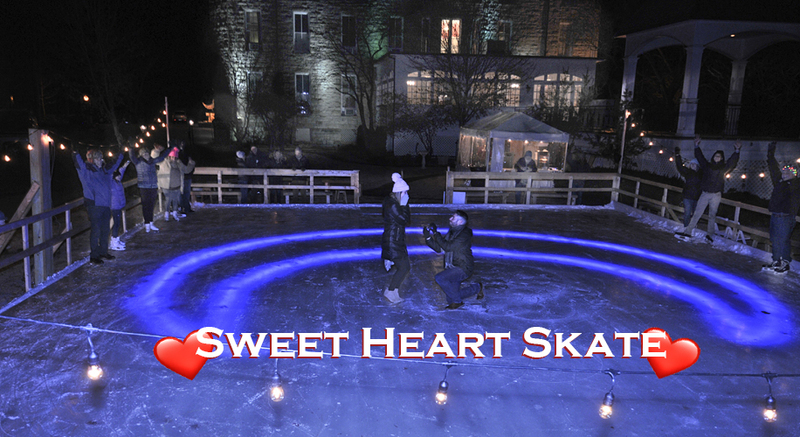 Sunday, 2/17 – “Sweet Heart Skate” Free Skate from 3PM-7PM. To help celebrate the advent of a magical new year, wizards have been summoned to conjure up some magic the last weekend in January here in a city known for strange and exciting events. The nights of January 25 and 26 will feature two such events; events of magical matriculation. Friday night’s event is “An Intriguing Prelude….” in the Crystal Ballroom of the 1886 Crescent Hotel & Spa. Creators describe the event thusly: “On the eve of the Wizards in Winter Crystal Ball comes an evening of intrigue and bewilderment hosted by a dashing conjurer and an enchanting ghost talker.” The conjurer is none other than Sean Paul, the nationally acclaimed illusionist from Eureka Springs’ Intrigue Theater. The enchanting ghost whisperer is the clairaudient medium, also from Intrigue Theater, the lovely Juliana Faye. 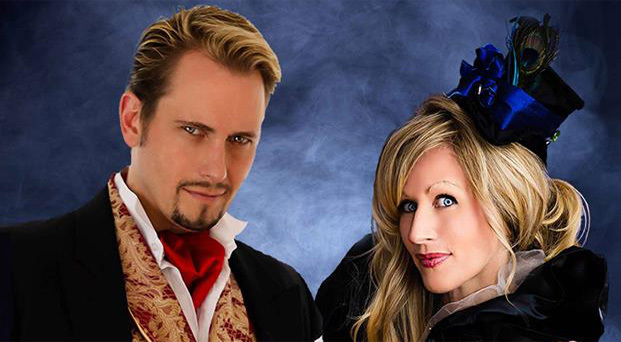 This mystical duo has mesmerized audiences from Vegas to the Bahamas. They have developed a presentation that embraces the wizardry theme of the weekend. And, to ensure an intimate setting for their bedazzling performance, a limited number of admissions will be made available for this first of its kind evenings. The doors and the cash bar open at 7:30 the evening of January 25. The performance begins at 8 o’clock. Tickets are popularly priced at $29.95 for VIP Seating (center row seats, only 50 available), $19.95 for general admission and are available through IntrigueTheater.com/event/magicalprelude/. BOOK A ROOM for Only $99 on 1/25 or 1/26 – Click Here. Then comes Saturday and the night’s much anticipated event, the “Wizards in Winter Crystal Ball” set in the Crystal Ballroom of “The Crescent College of Magical Matriculation”, a.k.a. the 1886 Crescent Hotel & Spa. 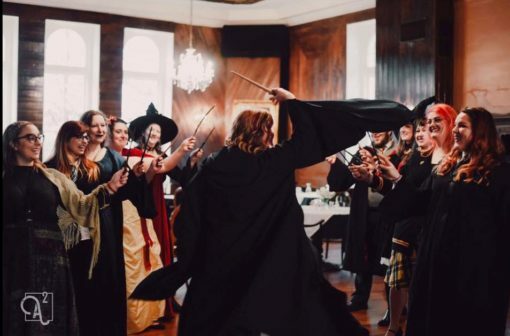 The administrators of “the College” are inviting guests to “gather their finest dress robes, best hat, and of course their magic wand” and prepare for a totally unique evening. Organizers are saying that “professors and students of wizardry” (those who get a kick out of such goings on) are welcome to attend for “a ray of merriment” amid cold weather outside by “gathering just past the fireplace and just inside the room of enchantment for a beguiling evening”. To make this event the social gathering of year yet to come, formal/magical attire is required. The night is designed for adults 21 and older. 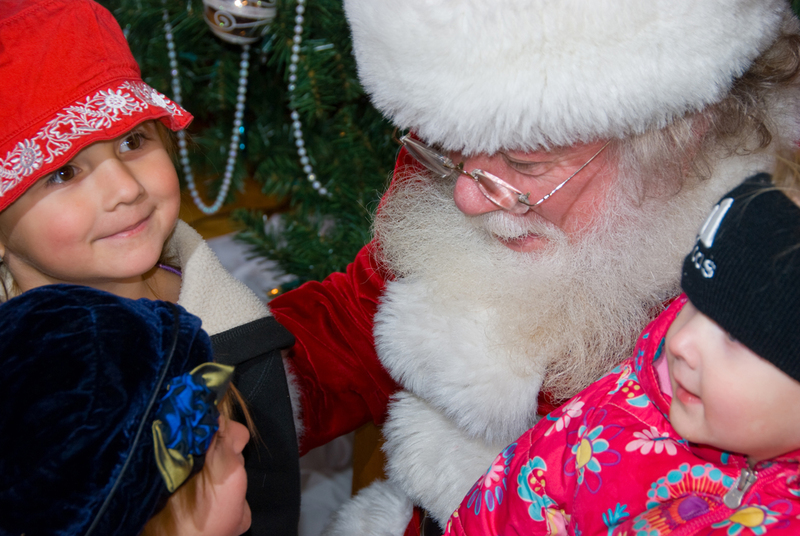 Partial proceeds from the event will benefit The Merlin Foundation, a public policy and advocacy organization for abused and neglected children with a special focus on the family. 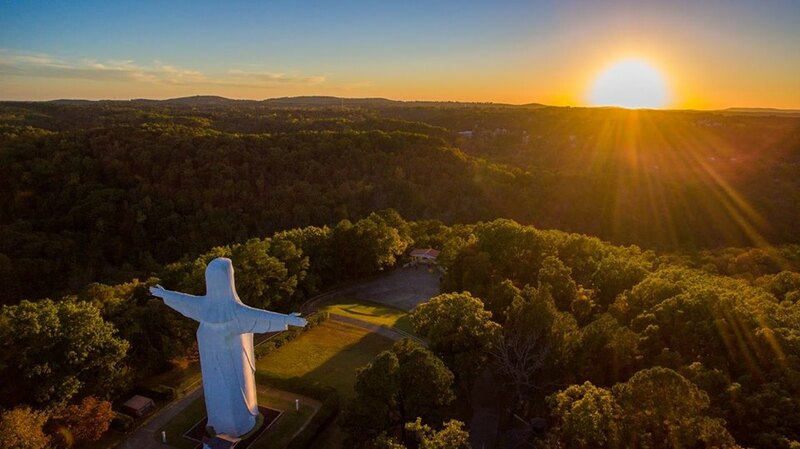 The foundation is headquartered in Berryville, Arkansas. 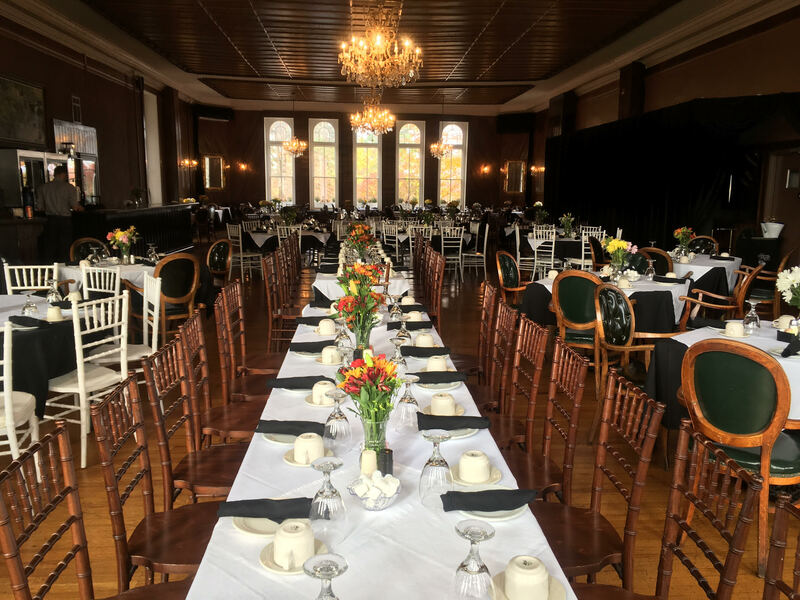 The ball welcomes guests at 5 p.m. when the cash bar featuring “many magical libations” opens, followed by dinner at 7. Ticket information available at WizardWayoftheOzarks.ticketspice.com/wizards-in-winter-crystal-ball.